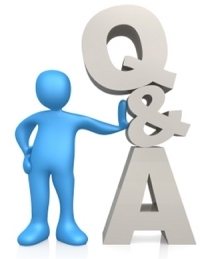 We have worked in nearly all sectors and have in-depth knowledge of most business’s. We create PPC campaigns that are targeted and aligned to Google guidelines with in-house optimisation that reduces costs and increases exposure. We have a team of qualified Google Adwords consultants who will manage your account. Analysis and identification of positive and negative keywords to increase conversions maximising your return on investment. We have over 13 years experience with Google Adwords. We are leading Google AdWords PPC (Pay Per Click) – paid search agency with over 15 years experience offering a trusted AdWords PPC management service for Bluechip companies to small start-up businesses. We are a leading Google AdWords Agency with full Google Business Support making us the number one choice for clients across the UK. With results driven by our analysis and optimisation reducing your monthly spend and increasing the number of leads or sales. We have a competitive edge over other digital agencies being able to offer more due to our deep links with Google being hand picked as a leading UK agency with full Google Support and Account Management teams. Get a FREE Adwords Health Check and see what we can save your business! Google AdWords can be the most important part of your advertising and can be cheapest form of advertising you run. But in the wrong hands however, it can be a total waste of time and money. Chameleon Web Services manage clients AdWords accounts and have successfully lowered expenditure and increased targeted traffic and sales. Our AdWords Management services have allowed clients to reap the benefits of the AdWords system, whilst lowering costs, increasing traffic providing improved results by fine tuning the AdWords improving ROI giving increased profits. We manage all aspects of your Google AdWords account, starting by identifying the aims of your campaigns, and then identifying high performing keywords to target the audience you require. We can work to any budget no matter how large or small that is. We have tracking on all the ads as an ongoing concern and monitor every visitor to your site. Our pricing for the Google AdWords package depends on your specific requirements. If you are currently paying for an AdWords package, we strongly recommend that by using us, we can reduce the cost you are paying and increase traffic. This reduced cost pays us and the increased traffic puts more money in your pocket. 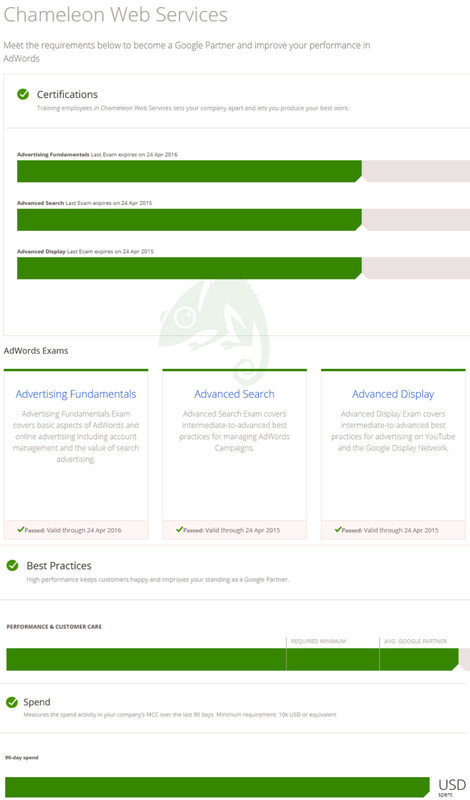 The main benefit of using Chameleon Google AdWords Campaign management is to free up your time, as time is money. Your AdWords Campaigns will be run by professionals, reduce your overall spend and will achieve low cost targeted traffic. You will receive monthly reports to show how efficient the AdWords Campaign is running, giving confidence that your Google AdWords campaign is being professionally budget managed and specific keyword research and optimisation increase sales and lower advertising costs. Want To Know More About Google AdWords? Google AdWords is the Pay-Per-Click advertising service that is offered by Google. Google AdWords is by-far the best way to get targeted traffic to your website or web page. The main source of Googles revenue is from advertising and this is something that Google have the market perfectly captured. If you pay Yell or Thompson to be in their advertising books then it will cost you a minimum of £1000 per year. In the technological world we live in today, people throw away printed magazines and leaflets as it clutters their lovely, new modern homes. If they want a plumber, some DIY materials, play bark for a childrens play ground, a garden landscaper or even a pack of batteries for the kids toys they use the internet and 99.9% of people use Google. Nearly all households now have a computer and everyone understands how important having a computer is. Even mobile phones are being developed for internet use now, for example the iPhone, internet banking is more and more popular and even shopping online and having your weekly shopping brought to you by a delivery van is now the norm. To appear in top position organically in Google takes a lot of effort and money. SEO is not cheap and is an ongoing task. However, Google AdWords are great as you pick your specific audience if you know how and become top using the Google AdWords program. 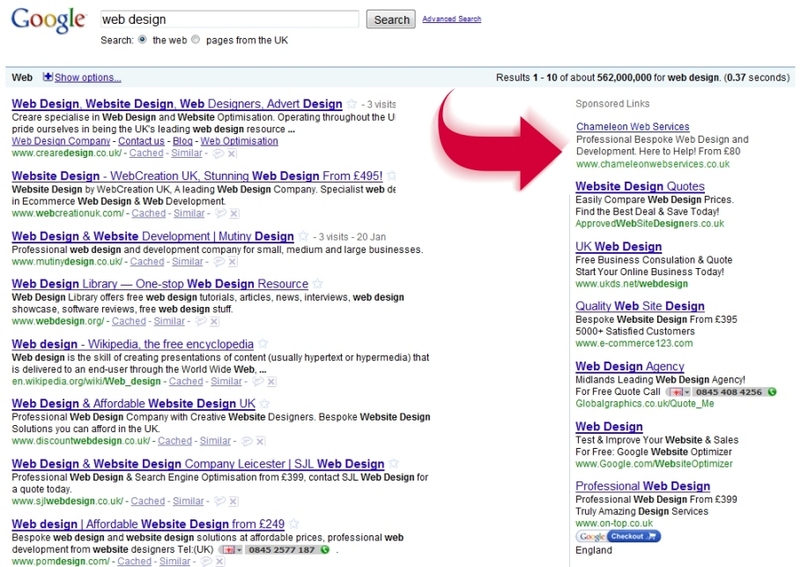 Below is an example showing Chameleon Web Services as the top paid advert in a Google search for “Web Design”. All Web Design companies want to be top in Google and this something that is very difficult to do. Chameleon are one of the UK market leaders covering all aspects of Pay Per Click marketing campaigns. We are a professional online advertising and design company and within our team we can carry out Web Design, Search Engine Optimisation, Google AdWords account management and much, much more. We are experts in increasing new business by pay per click advertising and we have a proven track record. As you can see from the screen shot to the left, the Google AdWords Account has an average position of 4.4 which means that they are appearing on average as the 4th Google Paid advert. Due to the customer not fully understanding the basics of Google AdWords they decided to put more money into it by increasing their cost per click. Another random week below shows that they have increased their cost per click to achieve a higher average position and their average is position 2.9. There expenditure is over £1000 a week with reduced click to achieve a higher average position. At this point they were achieving average sales of 70 sales from 5000 visitors costing £1000 a week which was only just covering the costs of the Google AdWords. Chameleon Google AdWords Campaign Management came into effect and we analysed their keywords and worked out that many of the people were window shopping and not customers. We created a few reports and recommendations and then we were able to make changes that we had confidence would make massive improvements. As you can see from the screen shot from the Google AdWords account, the expenditure is now £148.32 a week. The average position of 3.9 was perfect as the customers were increasing and the costs were nearly 10% of the original costs. Best of all was that sales had increased to an average of 140 sales from 1000 visitors costing only £150 a week. Remember also that many Google Adwords accounts do not use the negative keywords correctly and this is a great way to save money. We offer a free consultation, so what are you waiting for? How Do You Become An Official Google Partner? If you are setting up a new Google AdWords campaign, take advantage of the unique offers we can provide as a Google Partner. We have £150 AdWords vouchers provided by Google.